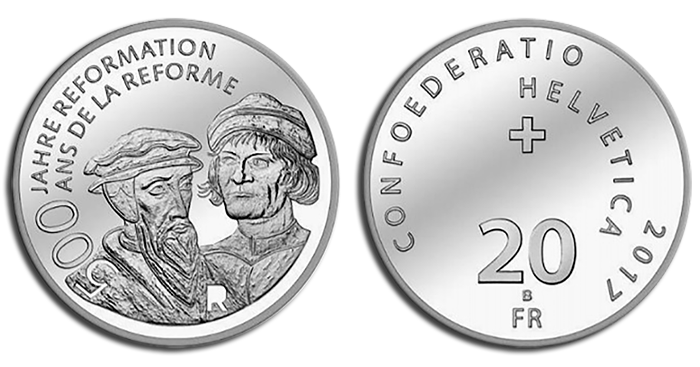 The Swiss Federal Mint launched (26th January) a new 20-franc silver coin marking “500 Years of Reformation”—the quincentennial of the Protestant Reformation, one of the most significant European events of the 16th century. The Reformation began in the small town of Wittenberg in Saxony, Germany, in 1517, with the publication of The 95 Theses. This doctrine was authored and, more importantly, printed by a popular local reverend by the name of Martin Luther (1483–1546), who on the 31st October 1517 is said to have nailed his 95 Theses to the door of All Saints’ Church. (It is more likely that he simply posted a letter, along with a copy of his doctrine, to his bishop, Albert of Mainz.) Within a very short timeframe, Europe was in the grip of the Reformation, which resulted in cultural, social, and political upheaval that still affects our European and Western societies today. In Switzerland, due to the action of Ulrich Zwingli (1484–1531, remembered as the leader of the Reformation in Switzerland) and John Calvin (1509–1564, an influential French theologian and pastor), the Reformation became an important catalyst on the road to the modern age, democracy, and human rights. (Scroll past the table for more on Luther, Zwingli, and Calvin, and on the special role of the printing press in the Reformation.) As in many other countries in Europe where the the Reformation played a significant role, the anniversary of its beginning is being celebrated this year in Switzerland. 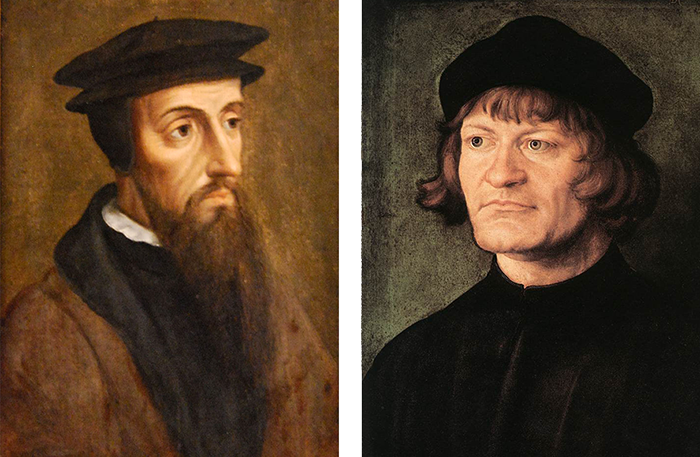 John Calvin (left) and Ulrich Zwingli. The coin is designed by Swiss graphic artist Ben Pfäffli from Burgdorf, Bern, Switzerland. 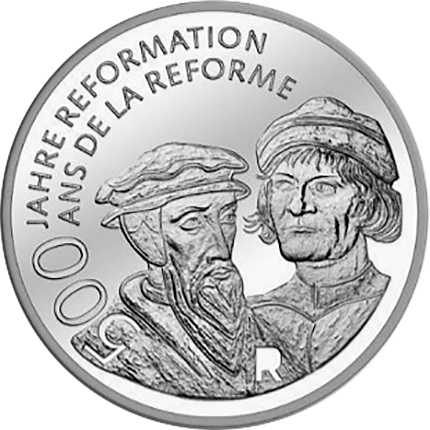 The obverse features detailed portraits of both Calvin and Zwingli, whose depictions are based on well-known portraits of these reformers painted during their lifetimes. The commemorative inscription includes 500 JAHRE REFORMATION / ANS DE LA REFORME, placed at upper left. 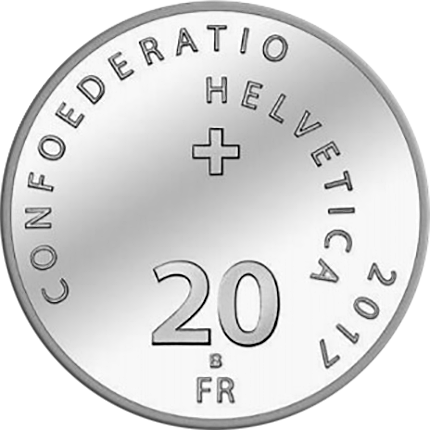 The reverse displays the denomination 20 / FR, the text CONFOEDERATIO HELVETICA, and the year of issue, 2017, on a clear field. 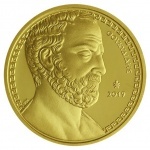 The coin is available in Brilliant Uncirculated with packaging options of 28,000 units in a blister-pack and 2,000 in a special printed folder. The Proof option is available in a presentation case with numbered certificate of authenticity. For more information on these and other coins issued by the Swiss Federal Mint, please visit their website. Swiss residents may also find the new coins in post offices and banks. The Protestant Reformation was a movement that took place in the early part of the 16th century. It involved religious, political, intellectual, and cultural upheaval that ultimately splintered Catholic Europe, the most revered and undisputed authority in much of Europe at the time. The Reformation essentially put into place the ability to question the structures and beliefs that would define the continent at the time and, as it would occur, into the modern era. Most notably in northern and central Europe, reformers such as Martin Luther of Saxony, John Calvin of France, Ulrich Zwingli of Switzerland, and even King Henry VIII of England challenged papal authority and questioned the Catholic Church’s ability to define Christian practice. These men put into place a doctrine or belief that supported the argument for a religious and political redistribution of power into the hands of Bible- and pamphlet-reading pastors and princes, instead of from the hierarchy of the Catholic Church. This call for a more equitable and sustainable distribution eventually led to wars, persecutions, and public denunciations of well-known and respected personalities of the time. The movement also ushered in the so-called Counter-Reformation—the Catholic Church’s delayed but forceful response to the Protestants and their stance. The movement was initiated by Martin Luther (1483–1546), an Augustinian monk and university lecturer in the town of Wittenberg, Saxony. He composed what came to be known as his 95 Theses, in which he protested the Pope’s ability to sell reprieves or absolution as penance for indiscretions against the word of God. He had initially hoped to spur or increase dialogue and renewal from church-goers and within the church. Instead, in 1521 he was summoned before the Diet of Worms—the imperial diet or assembly of the Holy Roman Empire, held at the Heylshof Garden in Worms, Rhineland-Palatinate—where Luther was declared a heretic and excommunicated. Afterward, Luther was sheltered by Friedrich III, Elector of Saxony (1463–1525), under whose protection he translated the Bible into German and continued his output of pamphlets and instruction in the vernacular of his contemporaries. When German peasants revolted in 1524, partly inspired by Luther’s empowering and encouragement of a “priesthood of all believers,” Luther unexpectedly sided with Germany’s princes. 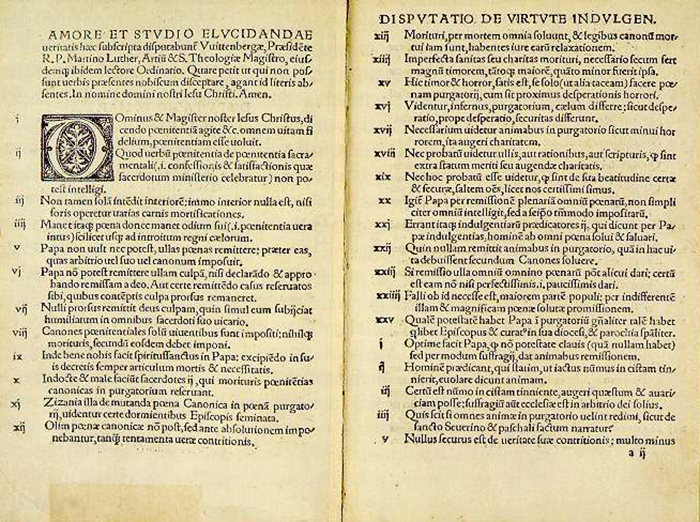 Historians usually date the start of the Protestant Reformation to the 1517 publication of the 95 Theses; its ending can be placed anywhere from the 1555 Peace of Augsburg to the 1648 Treaty of Westphalia. The Peace of Augsberg allowed for the coexistence of Catholicism and Lutheranism in Germany, and the 1648 Treaty of Westphalia for all intents and purposes ended the Thirty Years’ War. The original ideas of the Reformation consisted of a call to key elements of the clergy and hierarchy to purify the church, and a belief that the Bible, not tradition devised by liturgy, should be the sole source of spiritual authority. These ideals were not themselves novel, but Luther and the other reformers became the first to skillfully use the power of the printing press to spread their ideas a wider audience. It has been recognised that no other reformer was more adept than Martin Luther at using the power of new technology such as the printing press to spread his ideas. 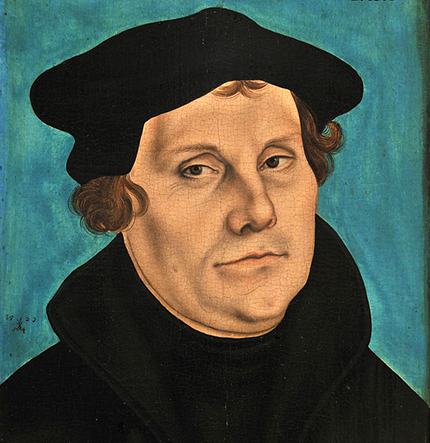 Between 1518 and 1525, Luther published more works than the 17 most prolific reformers combined. By the recognised era of the Reformation’s end, Lutheranism had become the state religion throughout much of Germany, Scandinavia, and the Baltics. Martin Luther died in 1546 in the town where he had launched a movement that was felt in much of Europe. He was survived by his wife Katharina and four of their six children. He was buried in the Castle Church in Wittenberg and is honoured on the 18th February with a commemoration in the Lutheran Calendar of Saints, and by the actual Christian denomination of Lutherans named in his memory. but whatever I have placed in God’s hands, that I still possess. Thank you for sharing the history. This makes this coin that much more interesting and historically important. The artist has also done good job. Fantastic coin . Another coin due for release next week and is absolutely stunning is – World heritage site of Slovak Karst caves …. Artist has really captured the details and imagination of people. This anniversary is so important to a number of countries, I wanted to include as much background information as possible, in order to give greater precedence to the coin itself and the fact that the implications of what occurred five hundred years ago still has a significant degree of importance today. It is surprising that no other country has issued coins in this important anniversary or perhaps they would be announcing soon. Also, did you see the Trans Australian Railway 100th anniversary coin ? Though it is only 25mm but the design is stupendous. Fabulous job by the designer.